Osprey Kestrel 68 is for any-trail, any-season. In wet weather and heavy downpours the built in rain cover provides protection. During hotter conditions the adjustable AirScape™ backpanel keeps you well ventilated whilst offering the load support you require. The spacer mesh harness and hipbelt ensure a supportive and comfortable load carrying solution. Whilst the adjustable torso length means the backpack can be altered to fit you perfectly. For overnight trips attach larger items such as a sleeping pad on the lower external straps and put your sleeping bag in the base compartment with internal zip divider. Keep the rest of your gear neatly organised with the hipbelt and lid zipped pockets and access the main compartment easily with the single side vertical zippered access point. Need your hands free for a short scramble? Our unique Stow-on-the-Go™ system means no more 'on and off' to store your trekking poles, just simply pass the poles through the two elasticated loops for an easy hands-free solution. The single ice axe loop may prove useful in winter conditions and wet jackets can be stowed away from the rest of your gear via the front stretch pocket. The dual side compression straps keep your load tight and under control. Kestrel pack is also compatible with both Hydraulics™ and Hydraulics™ LT Reservoirs so you can keep hydrated when hiking the trails. Once you're all packed then pull in the reverse StraightJacket™ compression straps to tightly secure your gear and get ready to go. All Mighty Guarantee from Osprey. 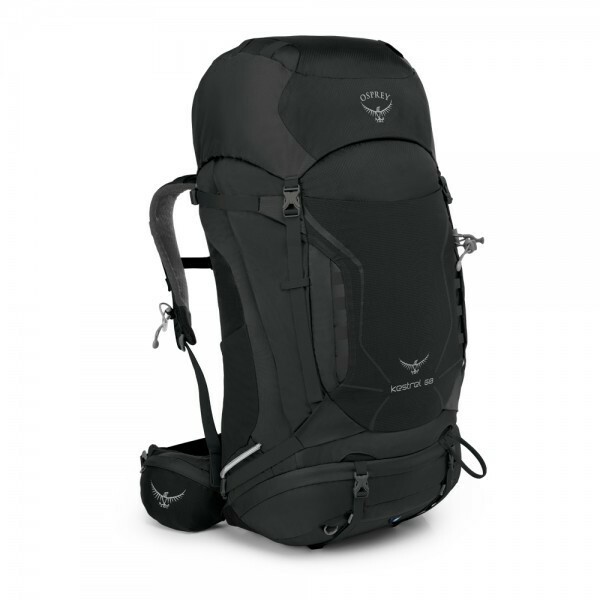 Lifetime warranty with any reason from Osprey.